But we’ve been making the most of the final leg of our journey. In Bobo-Dioulasso, our fantastic host Boubacar (AKA Baba AKA Colonel) proudly showed us around his fantastic city. Wherever we went, he got sidetracked by his many friends who, like us, were affected by his contagious smile. Boubacar is one of the most inspiring and hard-working people we have befriended, his limitless hospitality and generosity made our good-byes difficult. Since then we’ve covered some serious ground. After many months in several West African countries, we had got used to crossing borders to only initially notice subtle differences; the police wearing different uniforms, slightly sweeter tea… But coming into Ghana was like jumping to another world. The arid, monotonous and dry semi-desert of the Sahel has given way to lush trees, green green grass and tall bushes. The long straight flat roads have turned into hill after hill. And of course, the rain! Because the road we are using is quite a busy one, its side is littered with crumbs of exploded lorry tyres. These harmless-looking pieces of rubber lie quite innocently on the road, but in fact contain deadly shreds of wire which go straight through our tyres. Time for a new tyre… the kiss of luck! We often get asked, and ask ourselves, why are we cycling? A car would be much easier. But everyday that question is answered by the people we meet. Lannis’ family for instance welcomed us onto their farm, gave us lunch, water and a cool place to rest. Now we’ve covered some kilometers but Mikaela’s tummy is sulking and she is struggling to eat enough… Making the already difficult hills insurmountable! On a low: Only 5km into our day of cycling and a huge thorn has buried itself within the depths of Mikaela’s front tyre and is causing multiple punctures. Time for a new tyre. Mikaela gives her new tyre the kiss of luck! On a high: A long day of pedalling and we arrive at an actual hotel. As students on bicycles we are swiftly shown to a cheap spot on the roof… we discover the hotel has a swimming pool and sneak lots of cheeky dips free of charge. On a high: We rest our piste-shaken bones in the small village of Tedie Kanda. 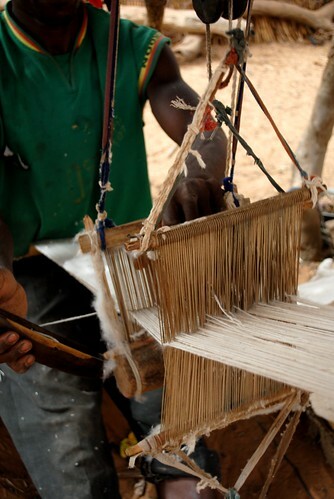 It’s an artisan village of Dogon people and we are invited to meet the local weavers at work. On a low: The dust is bad and the borderland is much bigger than the map told us. 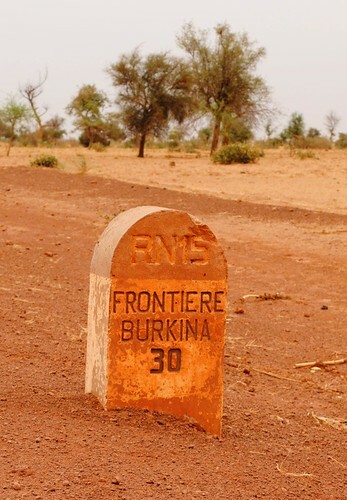 On a high: At the Malian exit point, we worry about our dodgy visas (Imran was mistakenly given a 100 years duration). 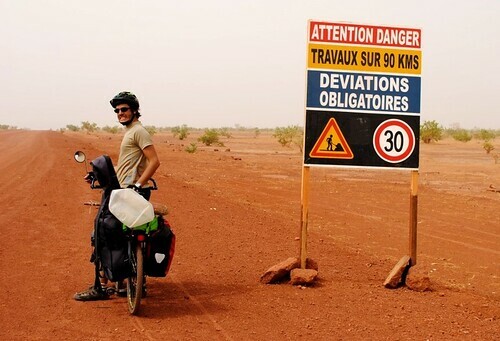 But it seems the officials are so happy we took the road against the advice of ‘evil Sarkozy’ (we assume a reference to the kidnap warning recently issued by the French Embassy for this particular road), they offer us tea and barely even glance at our invalid visas. Orange faced and mud splattered we have reached Tambacounda where we have stopped for a day to catch up with the bores and chores of our little world. 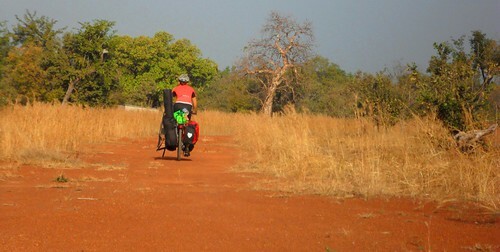 After some rather dusty terrain into the city we arrived to notice our bicycles were looking rather tango-ed. Thus a deep clean was in order for the bikes, panniers and most of all, us. 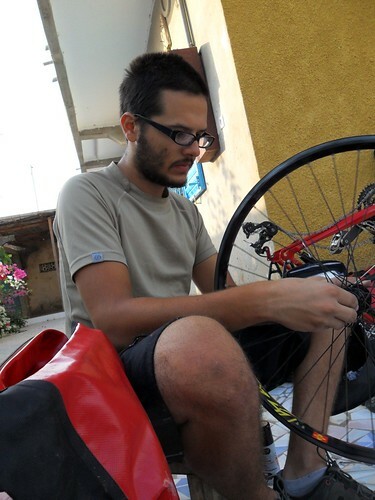 Imran managed todays cleaning operation, becoming something of an expert at wilderness bike maintainance. Without explanation he had informed me a few days earlier that he was ‘going out to find a piece of scrap metal with a few holes in it. See you later’. A couple of spokes from his back wheel had broken on the bumpy road to Ziguinchor and we realised that both were on the mech side. This means that in order to change the spoke, we needed to remove the gear cassette, which requires a special key. With no alternative, this tiny piece of metal was DHLed to us, but we nearly lost hope when we realised we also needed a chainwhip. As we began dreading the wait for another package, Imran got inspired to employ some local metalworkers to make this amazing tool. Though I had become doubtful of his creative ideas I was proved wrong and his homemade chainwhip was pretty impressive. Whilst Imran busied himself with bike jobs I found myself reluctantly discovery my domestic capabilities; handwashing our putrid clothes before repairing socks and sewing up the bedraggled guitar case. 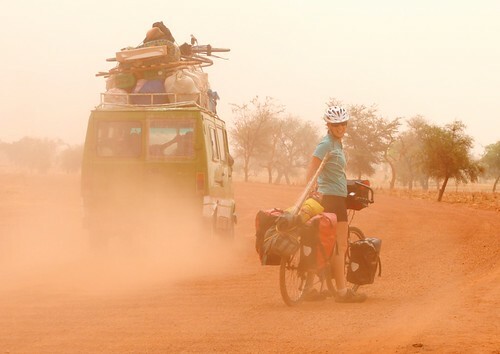 But we are both feeling a renewed sense of energy for the journey ahead, a journey which in only a few days will see us cross the border from Senegal to Mali. It looks like it’s time to say goodbye to Senegal. Yesterday Mikaela celebrated her 22nd birthday. Having been reminded of the importance of birthdays in Mikaela’s family home, I knew that my well-being depended upon her day being special. So I thought I’d begin with an English breakfast in bed. This was no easy task, and the menu choice was of course dictated by a lack of pork! The final result of my market shopping skills was fried tomatoes, eggy bread, scrambled eggs, avocado smoothie and the pièce de resistance Heinz baked beans. Not a strictly traditional menu but Mik was content to break from the normal routine of a cheese triangle smothered roundbread. I hear you asking “where on earth did you find Heinz baked beans in Western Sahara?”. They were in fact purchased in a tiny shop in the even smaller town of Olonzac in the south of France, which had a small section for English holidaymakers. 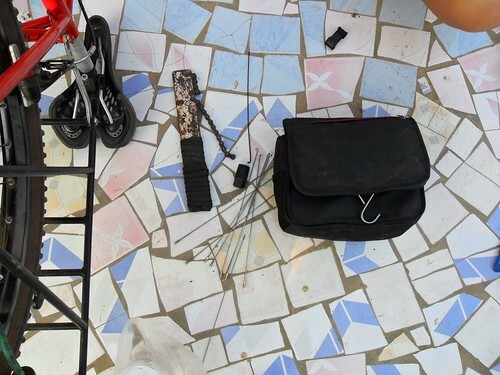 The tin then survived several thousand kilometers undetected by Mikaela in one of our panniers. On the morning of her birthday, I snuck out early to seek a kind café owner who would let me use his kitchen (a stealth operation for those who know Mik’s light sleeping and early morning wakening). Using the fresh supplies from the market, I clumsily stuck the meal together, turning down a few potential buyers of her breakfast. I then cautiously loaded it onto the plate I had also bought in the market and woke Mikaela to the smell of beans and toast. Sometimes the things that at home are pretty normal become much greater tasks and sweeter surprises in this case! Equally the hairbrush and nail varnish that Mik unwrapped with the excitement of a five-year old were appreciated so much more. The little, simple things that can make us smile. So now, with a birthday behind us we are ready to leave Dakhla. As we try to make sense of my knee grumbles, we are approaching the deadline of our single-entry visa to Mauritania on the 4th of November. So it seems we’ll have to load our bikes onto another truck at least until the border where we will negotiate the generous no-man’s-land by bicycle.